As a bit of a preamble, I am not the sort of person who loves your average biopic. Biopics are an inordinately tough nut to crack if you sit back and think about it, as you have to weigh the demands of a realistic portrayal of a person who could have existed in front of our very eyes, versus the demands of what makes a film an actually enjoyable experience to watch for the sort of plotting and character development standards we have grown to expect from modern movie conventions. The result of this is a long litany of tiresome, often bloated and overlong or cloyingly sentimental takes on the genre like A Beautiful Mind or Cinderella Man or The Iron Lady or The King’s Speech. Many of these films win Academy Awards, often for the actor or actress in the lead role as well, which serves to reinforce the genre for future actors and directors. We know that as the Academy gets older and older, its pull on the film industry matters less and less to up and coming directors. But the major studios still hold sway over the direction of the industry as a whole (for now; as digital distribution gets better and more widely adopted for studios along the lines of Magnolia Pictures, the sway diminishes), as those studios still like prestige biopics that win Oscars. It’s obvious because they continue to make them regardless of quality, and a film like The Iron Lady gets made and released purely as a cart-before-the-horse case where everyone paid attention to how awesome of a Margaret Thatcher Meryl Streep made without actually paying attention to how godawful the script was. And almost everyone who saw the film hated it but liked Streep (and, to be fair, she is quite good), and she won the Oscar. And so the circle remains unbroken. This is not to say that making a good biopic is impossible. The best biopics don’t feel like biopics; they feel like movies that happen to be about a central character (as most films, real-life based or entirely fictional tend to do), and that character happens to have been a real person at some point along the way. A film like Lincoln is about a real man who is the center of the action, but the beauty of Lincoln is that it is not really about the man. It’s about what’s around the man and how he reacted to situations. Spielberg and Kushner made a film about the fight to ratify the 13th Amendment, and did so through the lens of Abraham Lincoln. Gus Van Sant’s Milk is about the gay revolution of the 1970’s and how it was reflected and seen through the eyes of one man. The same can be said about The Social Network (which feels the least like a biopic of any of these examples), which is nominally about Mark Zuckerberg and more about the founding of Facebook, but is really just a story about a man and his friend drifting apart under the pressures of modern internet society. These are all wonderful films first and biopics second, which is why they work. You get into trouble when you get the priorities wrong. This is what I hoped I would get out of Dallas Buyers Club, the story of the life of Ron Woodroof, a straight Texas man who contracts AIDS in the 1980’s, back when everyone assumed that it was a disease strictly contained within the homosexual male population. The film tracks Woodroof as he fights the disease and the injustices of the Food and Drug Administration’s practices pertaining to approving drugs to fight HIV, eventually using various loopholes to import illegal drugs into the United States and get them to the people who need them to survive, including himself. The potential is there for this to be one of the good ones. It has a central, overarching issue that’s bigger than the man, and can be designed in such a way almost as a companion piece to last year’s excellent documentary How to Survive a Plague, only told from a completely different perspective. I wish it were true that director Jean-Marc Vallee and screenwriters Craig Borten and Melissa Wallack could have given us something like that. But unfortunately, Dallas Buyers Club is much more like The Iron Lady than Lincoln. It is (thankfully) relatively light on treacle, and doesn’t worry itself with having too many BLATANT OSCAR MOMENTS that sunk the Ron Howard/Akiva Goldsman/Russell Crowe biopics that represent the dregs of the genre. It has a great cast led by Matthew McConaughey (more on him later) and Jared Leto, supported by a bevy of solid character actors like Denis O’Hare, Dallas Roberts, Kevin Rankin and Steve Zahn. Vallee has a good idea for the camera, and creates an evocative washed out look for 1980’s Dallas, Texas to match the emaciation of essentially every character we come across. This had nearly all the pieces to be something special. But the one piece that is lacking in Dallas Buyers Club is arguably the one you can least afford to be subpar. The script is a mess. You can’t blame McConaughey for why the character of Ron Woodroof just doesn’t work on the screen. He’s had such a remarkable career turnaround in the past two years that I still can’t fully believe that he’s gone from an actor that actively makes me want to not see his films due to his involvement (I would call this “Keanu Reeves status”) to become someone I would go out of my way to see just about everything he’s doing (I refer to this as “Michael Fassbender status”). To go from Reeves to Fassbender in two years is unthinkable, but when you actually look at the absurd run he’s on, it just makes sense. I don’t know if anyone in Hollywood can match the resume of The Lincoln Lawyer into Bernie into Killer Joe into Magic Mike into Mud into Dallas Buyers Club, with The Wolf on Wall Street and Chris Nolan’s Interstellar on the horizon. It’s madness. And he’s amazing in every single one of those movies. Including Dallas Buyers Club. His Ron Woodroof is a magnetic force on the screen, at once disarmingly charming and charismatic, while also never losing a sense of the bigoted, shortsighted, conceited, vile prick who gets into his mess in the first place. He owns the screen in the same way he’s owned the screen in the last two years, and it is ever so easy to fall under his spell. The problem with the screenplay is entirely one of trying to accomplish too much in too little time. The biggest casualty of this story is character development; it does not adequately take the time to set up and act on Woodroof’s changes of character, instead essentially forcing him in a different direction whn he needs to go that way. Ron Woodroof begins the story as a (presumably) barely educated hard-partying super homophobe, and ends it as an accepting hero of the Texas gay community (though always still out for himself as his first priority) who can casually and continually evade federal agents through spy-like international intrigue and jetsetting around the world as he works to get the drugs he needs for his Buyers Club. I’m not saying that the real Ron Woodroof couldn’t have changed his tune in such a way that we see in Dallas Buyers Club. But he had seven years to do it. We have 115 minutes. As such, Woodroof’s silver screen personality turns on a dime, shedding his homophobia like an itchy coat when it is required, and seemingly developing new skills out of the blue just as the situation arises. You could chalk it up to a man fighting to survive and doing what he must out of that instinct, but it doesn’t hold up under scrutiny. The house of cards begins to tumble as the film’s length stretches toward the second hour. It’s not all bad (though I won’t go into Jennifer Garner, whose thankless character is all bad in her existence as an empty plot vehicle); as I said, McConaughey is wonderful even if his character is thoroughly unbelievable by the end of the film. Jared Leto continues to impress, as does the litany of actors in smaller roles (It’s especially nice to see Kevin Rankin, he of Friday Night Lights, Justified and Breaking Bad continuing to further his career on the big screen). And Vallee has a strong eye for visuals. But it’s all built upon a shoddy foundation. 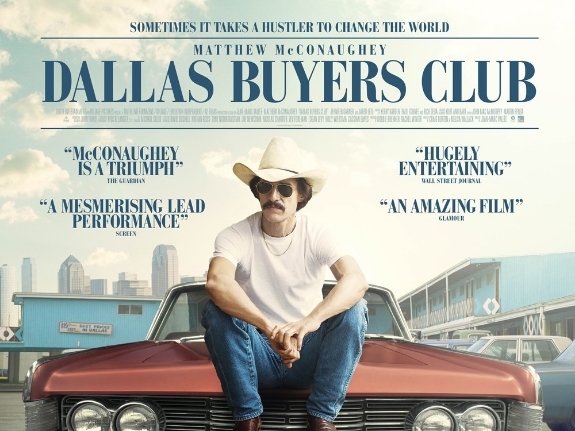 Dallas Buyers Club should have followed in the footsteps of The Social Network and Milk. But in the end it was just another The Iron Lady.